Happy Monday everyone, I hope you all had a fabulous weekend!? I love Cottage 45's beautiful crochet and My Little Red Suitcase's delicious buttons! Oh, so so beautiful. 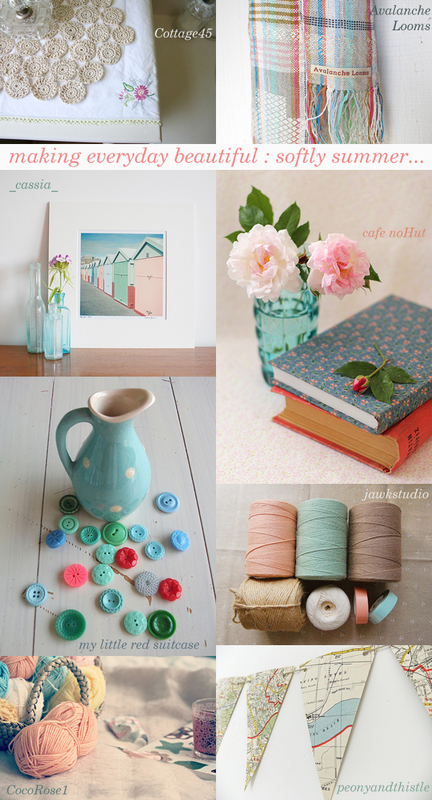 I adore these moodboards, they brighten my days no end. Thanks emma, this is so inspiring today! Beautiful finds! Good to hear you managed to have a relaxing time over the weekend. I think I need to do that some time soon! What beautiful colors...love the combination! What a great pleasure to be in this wonderful group. Glad to hear about your relaxing weekend too. These pictures for starting a new week full of inspiration and sweetness. Thank you! Hi Emma, lovely to be part of your pretty collection of colours! Beautiful shots - lovely colours and tones! Glad you are taking time to enjoy the last of your northern summer. Our Spring is in the air smattered with the fading hints of our winter. Love your beautiful Monday pics.